Get the position (x, y, z) of the body at index body. Get the quaternion of the body at index body. Get the linear velocity (x, y, z) of the body at index body. Get the angular velocity (x, y, z) of the body at index body. OpenDE State. This is a compound state that allows accessing the properties of the bodies the state space is constructed for. 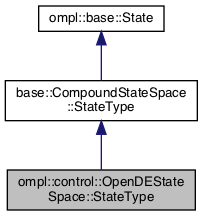 Definition at line 79 of file OpenDEStateSpace.h. Flag containing information about state validity. Definition at line 138 of file OpenDEStateSpace.h.